With the title “Exploring the Role of Psychology in Creating Healthy Society”, Widya Mandala Catholic University – Surabaya (UKWMS) presented a forum to share thoughts, knowledge, scientific research and ‘the stories behind’ from the experts. 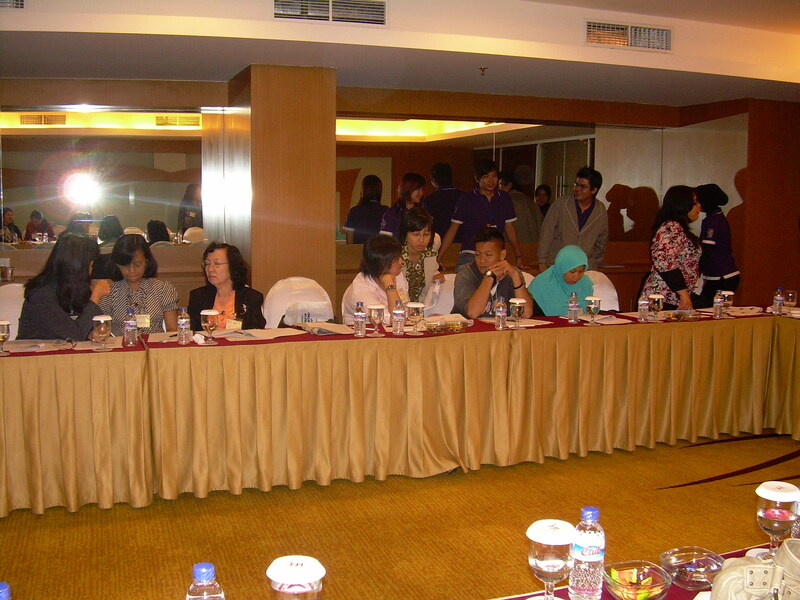 This two days convention was held in Mercure Grand Mirama Hotel, Surabaya. I consider myself as lucky to be there. 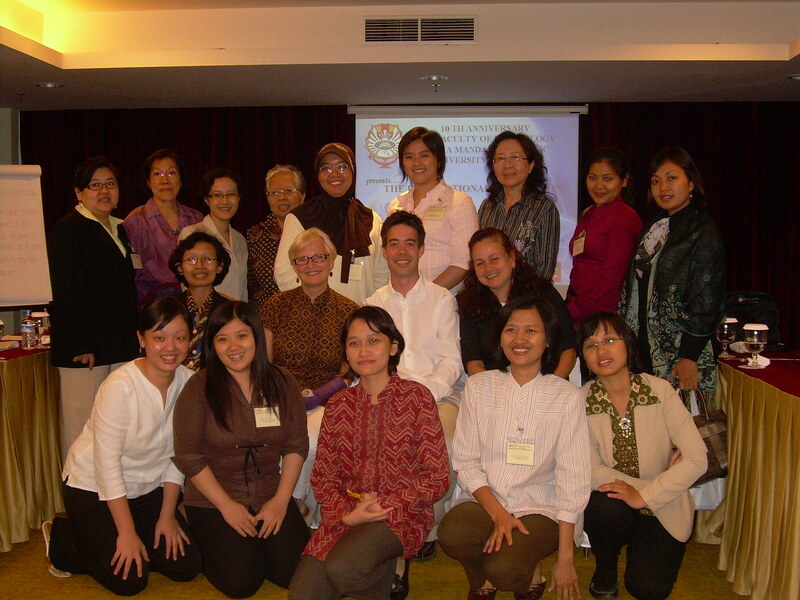 I joined the whole sessions of seminars and workshop for 2 reasons. Firstly, I have to prepare myself to complete my masters in Psychology and secondly, I need to build relationship with the experts if I want to be succeed in this field. 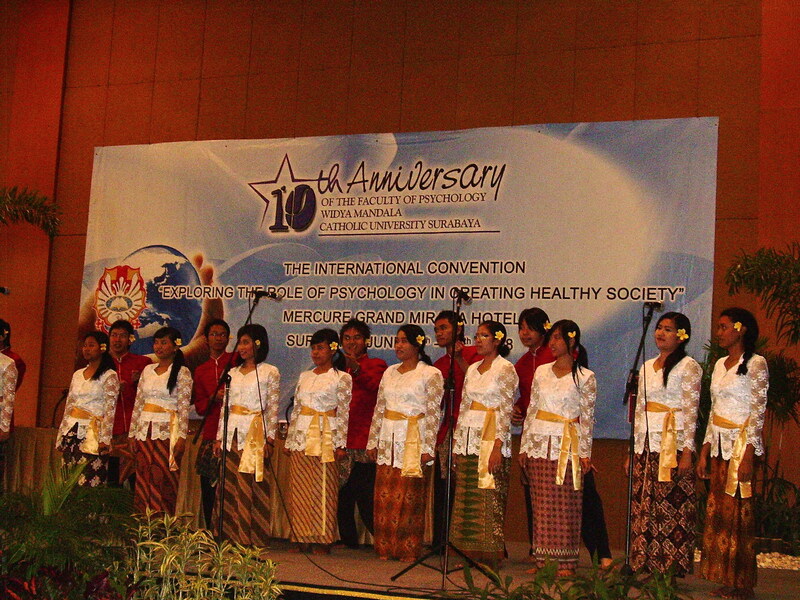 The first day was opened by a wonderful performance from UKWMS Choir, Cantate Domino. They sang two Balinese songs and they even danced! It was totally outstanding. Not long after, the seminar was started by two keynotes speakers, Heather Gridley (School of Psychology, Victoria University) and Margaretha Sih Setija Utami (Soegijapranata Catholic University, Semarang). Heather shared her experience and research on the connection between community art and health promotion. Her research proved that singing has good effects for health and wellbeing of individuals and community. She is a member of community choir in Melbourne which consists of numbers of women with their own backgrounds. They support each other in a way that can transfer the positiveness of being together. 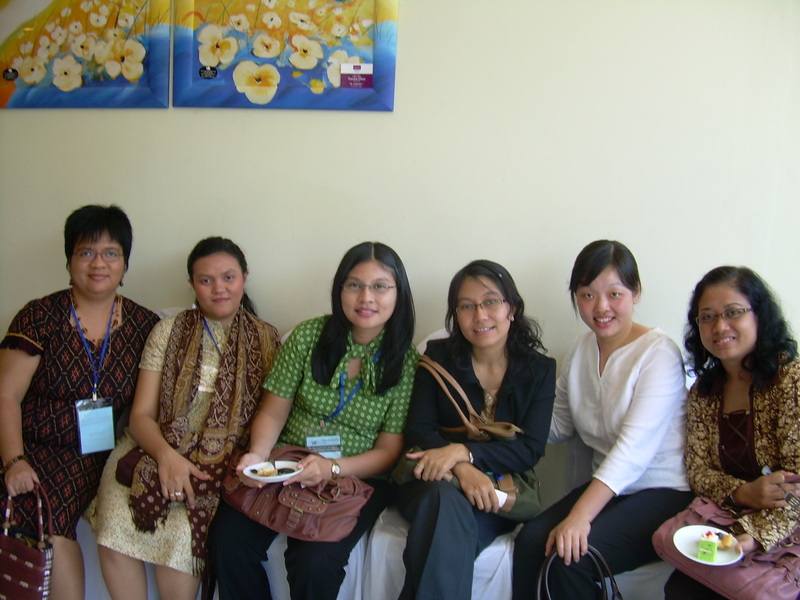 Meanwhile, Bu Sih talked about the contributions from psychology to safe motherhood. It was her dissertation for her PhD. The next two speakers were Associate Professor Rozmi bin Ismail and Yohan Kurniawan, PhD. Both were talking about Road Safety and Engineering Psychology consecutively. Prof Rozmi found that traffic fatalities has become a public health issues in many countries, especially in developing countries. It seemed that reckless driving behaviors were connected with mental health. Doctor Yohan brought a new topic of engineering psychology in Indonesia. It mostly talked about the connection of human and machine elements. During breaks, there were numbers of presentations from lecturers, psychologists and researchers who were consistently worked hard in the field of psychology. Their topics ranged from child education, child abuse, parenting education, healthy habits, self-image, smoking and drug using, safety riding, community health and many more. I believe that one day I will be part of them and not just the listeners. Robert Yates, Linda McDonell and Beverly Revin were the lecturers from Malaspina University – Canada (www.viu.ca). 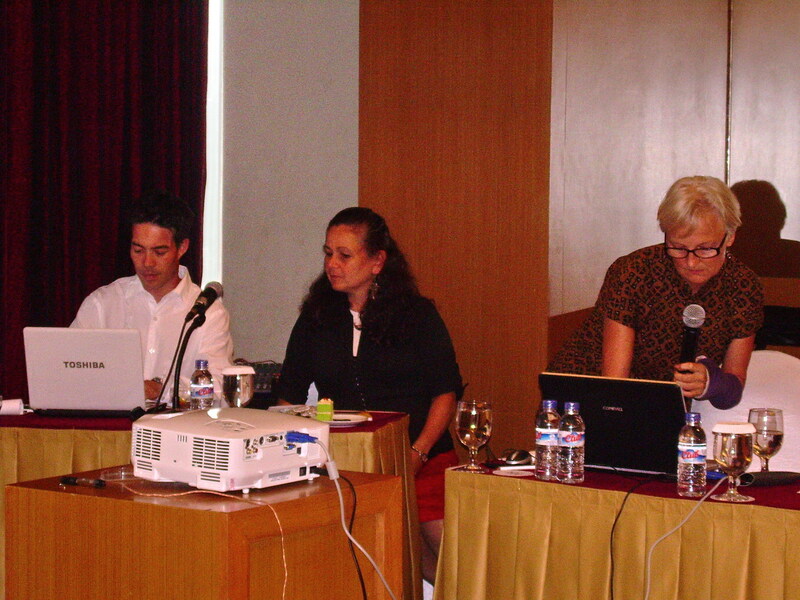 They were presenting a workshop on ‘Addressing Challenging Behaviors in Early Childhood & Child and Youth Care’. They came up with the topics of what the ECEC and CYC professionals do in their field and what are the barriers and challenges that might come. All the participants were actively involved in discussion, asking and answering questions. We shared our own experiences in Indonesia, because all the materials were presented in Canadian perspectives. Nonetheless, it was a useful tools for all the participants, because now we know what is the ideal form of how to take care the child and youth in advance. It’s so good to know that psychology faculty of UKMWS had succeed to celebrate this event. By the way, I haven’t mentioned that this International Convention was held to celebrate the 10th anniversary of the faculty. I wish I will stand up in the podium as a speaker one day. I will be part of this community and play a role. As Linda told me to keep up until PhD (well, it’s not just a dream… ). I’ll check the opportunity to fly to Canada!